Special Match Notes: This match is a TITLE MATCH: the winner of this match will recieve an ozfl6's Division 1 Title. Special Round Notes: This round is 3 weeks long and goes over the Christmas/New Year Break. Have a good holiday! Last edited by OnionS; 19-12-2008 at 00:37.
probably rather play before christmas if possible? Last edited by nsk; 19-12-2008 at 14:02.
as mentioned we cant say yes with 100% certainty, until the match time is set. tho we are keen. will be in contact and when the match is set, will see who is available. 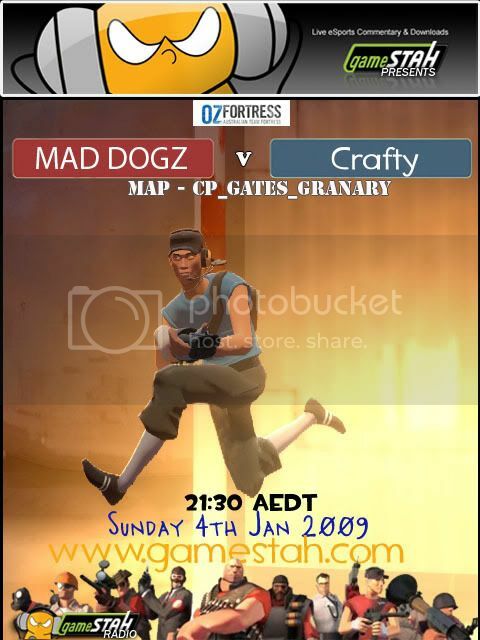 ... best of luck to crafty and MAD DOGZ! anyone from crafty want to say yes/no to monday 22nd/tuesday 23rd 9.30pm? Last edited by nsk; 21-12-2008 at 11:11.
is there a particular reason you want to get this game done before xmas? we prefer to play after new year as one of our guys is going away during the xmas break. how will you guys be for numbers after new years? Had a few people quit tf2/join different clans and so (I haven't actually checked yet lol!) one of our "core 6" that we'd want to use for this is probably no longer on the roster. If it's a problem then we can of course find another 6th from our plentiful supply of *casual raiders*. GG Guys was a pleasure to cast it.